It's not true there are just two competitors. I like thermalright more, infact I have bought one of them to cool my ryzen 2600x. ... and I dont mind brown color of noctua if it's a better fan. rpjkw11 and Reehahs like this. A welcome addition and the price won't break the pocket book ..... now we'll just have to see how it really performs. You have to be really gullible to believe brand cfm and db on fans. "As you’re probably already thinking, however, Noctua has one serious weakness: they paint all their fans a very ugly brown"
The problem is, they don't come stock on their coolers. The pro fan models are 3K rpm, instead of 2K. I have a Noctua on my most recent build, I found that if you don't dwell on it, the tan color of their fans becomes a non issue. Some of us don't like having a window into our case and much rather opt for cases with sound dampening. In those cases.. If they found that color affected the performance of the the fan, and the best fan had to be 100% Opaque Couché ... fine. just offset the fans to other sides to avoid tall ram. There have been similar posts in the past.. and I'm surprised it hasn't occurred yet. Where are the PC dyson fans? best performance and sound no? As prices for fabrication tools are dropping.. might be worth trying dyi your own dyson'esque fan. It's patented.. but Dyson does allow others to use the patent.. might be worth trying to downscale it to pc cooler. Lovely, I also like when fans have textures. One thing I d change would be adding chrome line on top and one side. Or one golden line. Be quiet's fans are very good. I purchased a few of the higher RPM case fans and they move a lot of air for being so quiet. Now it's a bit too obvious that my hard drives make too much noise XD. Exactly. There are questions that need to be answered. For example was the loudness measured in an anechoic chamber. Which sort of amounts to revving you car or motorcycle's engine in a wide open space, or 2 feet away from a solid brick wall, which is more like a fan operating inside a case. What's the noise center frequency? Were the test results weighted? Which is in tune with what we can hear at any given frequency, and-or any given volume. (See "Fletcher-Munson loudness contour). Once upon a time the FTC was all over Hi-Fi manufacturers if their equipment didn't meet its published specs. But, "once upon a time", was a long, long, time ago. Lovely, I also like when fans have textures. As long as the texture doesn't cause the blades to collect more dust than normal. Or restrict air flow by causing the blades to spin slower. I have 2 fans from cougar with texture like that and they collected very little dust in 8 months. The strange thing is that I installed 2 cheap Aigo fans with standard shape and no texture and they have collected some dust already even though it has just been a month. Idk what to make of this observation beside the fact that Cougars fans material seems to be made of "slippery" plastic. It reflects light and is very smooth to the touch. meanwhile, Aigo's fans are made of that rigid black plastic which almost feels like micro sand paper. My desktop is with Noctua NH-D14, for almost 5 years now, and remains every bit as quiet as it was new. Agreed. And BeQuiet is nearly as bad as Thermaltake and Cooler Master when it comes to padding their specs favorably. 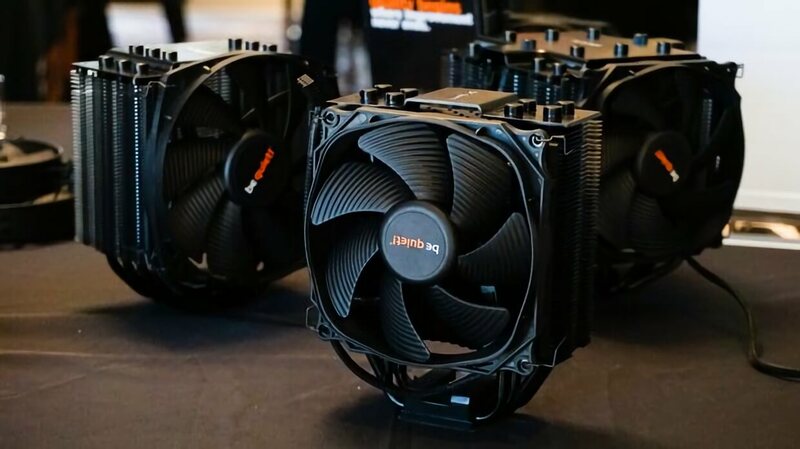 BeQuiet's fans usually achieve low db levels by reducing maximum RPM, not by spending months and sometimes years developing them like Noctua and Thermalright. If Noctua would simply offer an NH-U14S option with the chromax.black.swap fans on it rather than the standard brown fans, they'd practically eliminate any chance BeQuiet has of competing in this price range. Not on their CPU coolers though. That is the one thing that many builders won't look past and if they'd simply DO that, Noctua would be a lot more appealing to those users who value aesthetics as much as performance. BQ wins the aesthetics crown for sure, but Noctua still wins on performance across their entire product line. Looks matter to me so I'd choose BQ every time even for slightly more money and less performance.